Frack-Land: Image of the day: First Frack! 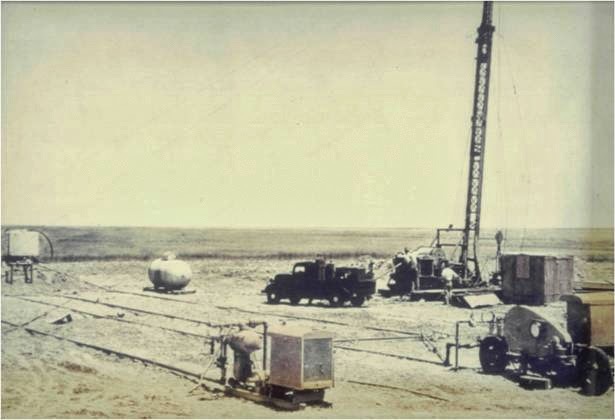 This is a photo taken of the first hydraulic fracture stimulation operation, performed in Kansas in 1947 by Stanolind Oil. Fracking has been around for many decades. However, it has evolved significantly during this time. In 1947, Stanolind used 1,000 gallons of napalm-thickend gasoline. Modern stimulations in shale reservoirs might use 1,000,000 gallons of "slick-water" - 99% water with chemical additives such as guar gum, polyacrylimide and hydrochloric acid.